The Jupiter String Quartet’s Rockport Chamber Music Festival concert on June 16 in the Shalin Lu Performance Center could have been subtitled “Everything In Its Right Place,” as it was a triumph of programming as well as performance. The evening began with one of Beethoven’s earliest quartets, Op. 18 No. 1, and ended with one of his last compositions, Op. 130, here with its original finale, theGrosse Fuge. Sandwiched in between was a Hungarian composer Gyorgy Kurtág’s Hommage à Mihály András: 12 Microludes for String Quartet, which beautifully illuminated the directions in which Beethoven’s legacy has led us. Beethoven’s Op 18 No 1 quartet is closer to the classical tradition of Haydn and Mozart than the romantic generation he inspired. The Jupiter String Quartet performed the work with a precision and dynamic and expressive restraint that emphasized the classical aesthetic. This exactitude nicely highlighted the interplay between instruments and delineated the layers of melody, countermelody, and accompaniment. Their classical sensibilities did not, however, prevent the Quartet from appropriately spotlighting Beethoven’s nascent romantic side, especially in the inner movements. Gyorgy Kurtág’s 12 Microludes pulled the audience into a very different world than that of Beethoven. Daniel McDonough’s engaging introduction did much to ease the transition. These twelve movements were extremely brief, the longest a bit over two minutes. Each one presented a particular sound world, from pointillistic and ephemeral, to sly and humorous, to mournful and atmospheric, that was fully realized even within such short time spans. 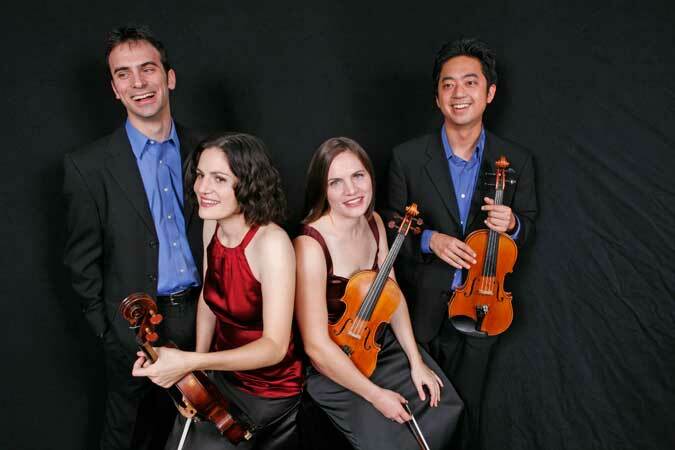 The Jupiter String Quartet displayed an insiring devotion to this sometimes abstract music. Each section demonstrated the same attention to timbre, line, and expressive trajectory that one is accustomed to with standard repertoire. As a result, not one note sounded random or out of place and every gesture was imbued with palpable meaning. The second half of the concert returned us to Beethoven, and his Op 130 quartet, complete with its monumental Grosse Fuge finale. The first movement is founded on a serious and weighty motif, and here the Jupiter String Quartet lingered on each sonority, rendering it with a rich timbre. They maintained this mood for almost all of the movement, only letting out a hint of the fun side of Beethoven toward the end. To my ears, the movement has a little more of that fun within it. The balance between the light and dark sides of Beethoven improved in the following three movements, with more dynamic contrasts and the right amount of playfulness. The fourth movement, marked “Alla danza tedesca,” had the charming and elegant momentum of a Viennese waltz. The fifth movement achieved an intensely lyrical, almost reverential mood wherein each instrument seamlessly emerged from and receded into a wonderfully sonorous texture. For those of us who knew what was coming, and perhaps for the performers as well, these movements, though beautiful in their own right, were in many ways a foundation for the excitement of the Grosse Fuge. The Jupiter String Quartet attacked the introduction with satisfying fierceness. Entrances of the deceptively simple fugue subject were well articulated so as to increase the work’s drama. This ferocity was contrasted with appropriately delicate and restrained passages. In the Quartet’s hands, Beethoven’s quiet sections, rather than provide respite from his relentless energy, strikingly served to heighten tension and make the listener breathlessly aware of the passion brewing underneath. In a few passages, I felt that the performance was too restrained for too long, but the intensity that inevitably followed more than compensated my anticipation. In the concluding section of the Grosse Fuge, the Jupiter String Quartet effortlessly careened through the fast and furious juxtapositions of Beethoven’s various materials with a joy that inspired the audience to give the ensemble a well-deserved standing ovation.